Homemade soap with its fragrance cannot leave anyone indifferent, especially when you also know how much benefit it gives to our skin and health in general. Below learn how to make a homemade soap at home and what is necessary for its production. Homemade soap is a real natural product that you will make easily and quickly, and you can enrich it with teas and essential oils, which are favourable for your skin. 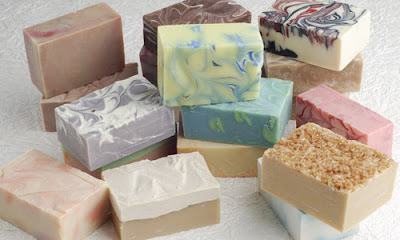 Garnering soaps or natural soaps that do not contain preservatives, dyes, additives and artificial fragrances, are increasingly popular and in demand on the market. If herbal teas and essential oils are added to them which favour a particular type of skin, they have medicinal properties. Recipes for homemade soap exist in several variants and we will use this opportunity to give some simple solutions for soaps that are made of soap base (white or baby soap, bought in a pharmacy) and its corresponding supplements. Making soap is largely a creative job, perfect for people who want to pursue a hobby. Above the choice of ingredients and flavourings that affect the homemade soap will smell great, for its design, you can use anything. Be creative, here are a few examples: Small home soaps can be moulded with plastic, in a box of chocolates, child moulds for sand, cake tins, moulds of aluminium strips. How to make a homemade lavender soap? This excellent homemade soap cleans, disinfects, refreshes and is intended for almost all skin types. In an enamel bowl put grated white soap, pour tea from lavender and gently heat it using steam, stirring occasionally with a wooden spoon, until the mixture is melted. Add lemon juice, remove from heat, allow it to cool and stir in lavender and almond oil. Pour into small oiled moulds and leave it to stand for 24 hours. The obtained lavender homemade soap leave to dry for at least two weeks prior to use. Homemade peppermint soap refreshes, disinfects, and promotes better circulation, good for impure and oily skin. Preparation: In an enamel bowl put grated white soap, pour mint tea and gently heat on the steam and, occasionally stir gently (with wooden spoon) until the mixture melts. Then remove from heat and leave for ten minutes to cool down. Add the mixture of ground oatmeal and essential oil of mint, then pour into greased moulds and leave for 24 hours to cool. Remove the homemade soaps out of the moulds and leave to dry for 15 days. Scented homemade soap with rosemary disinfects, refreshes, stimulates circulation, deep cleans the skin and prevents the formation of acne. Making soap at home: Put the soap in an enamel bowl and pour 4 dl of tea in it, and then gently heat on steam and occasional stir (always with a wooden spoon) until it dissolves completely. Move from the heat and leave it to cool down for ten minutes. To the mixture slowly while stirring, add starch, essential oil of rosemary and the rest of rosemary tea, until you get a creamy mass. With moistened hands form balls wrapped in foil and leave them for 24 hours. Remove the homemade soap from the foil, wrap in paper and leave to dry for two weeks. How to make homemade soap Mandarin flavour? Deeply cleanses and moisturizes, intended for greasy skin. The process for making soap: In the enamel bowl put grated soap, water and stir until dissolved. Remove the pan from the heat and add essential oils and extracts. Pour the mixture into the moulds gently, that should be tapped on the table for the mass to be homogenized, and then spray the exposed part with ethyl alcohol to make homemade soap smooth and free of bubbles. Allow it to stand for half an hour and store in the fridge for an hour. Remove the soap from the mould and let it dry for two weeks. Making the soap: Put the grated white soap in the appropriate enamel bowl and pour the tea of ​​chamomile and gently heat on steam, stirring occasionally with a wooden spoon, until the mixture is finely dissolved. Remove from heat and leave to cool for the next ten minutes. Add the mixture of almond oil, chamomile essential oil, powder of chamomile flowers and gently stir. Pour into oiled moulds and let it sit for a whole day (24 hours) to get the hardened mass. Extract from the mould, wrap in paper and leave them to dry for 15 days. Babies and young children are particularly highly sensitive to synthetic ingredients of a classic soap, so homemade soap with its enriched plant extracts is ideal for them. Of course, this product is recommended for adults, especially for people with sensitive and irritated skin, which have frequent sore and uncomfortable acne on the face. You need a glycerine base for the soap (clear one) in quantities of 200 grams. HOW TO MAKE A GLYCERINE SOAP? Cut the glycerine base into cubes, put in an enamel bowl and melt on steam with constant stirring. Remove from the heat, add the other ingredients and stir slowly. Lavender essential oil is added last. Pour the mixture into prepared moulds and spray with ethyl alcohol to make homemade soap smooth and without bubbles. Leave to cool, refrigerate for an hour and remove from the mould. Before use, leave for two more weeks to dry. Make it as follows: 50 g of fresh petals of marigold or chamomile pour with 5dl of olive oil (the best is domestic one) and mix well. Tightly close the jar and leave it in the sun for a month stirring occasionally. At the end filter it well, if necessary couple of times. Macerate must be without sediment. Pour the oil in a dark bottle and use if necessary. Finally, we leave you a compelling recipe for a homemade soap from goat milk, after which you will no longer think of purchasing expensive creams for the face. 1 teaspoon of honey locust (or other natural-domestic), if you do not have it take two to three teaspoons of sugar. To make soap from goat milk the most important is to work patiently and slowly step by step according to instructions and success is guaranteed. In a bowl, pour water and put in the oven to warm. Take advantage of the time until the water boils to grate the children's soap. As soon as the water starts to boil, reduce the oven to a minimum and place the grated soap first, then immediately add hot goat's milk and honey, and stir. It takes a good 20 or even up to 40 minutes for soap to melt, try to stir it periodically as not to cause lumps. Also during melting add a spoon of glycerine. You can also cover the saucepan in order for milk not to evaporate. During this period, you can feel free to add a little hot goat milk or water. Melted soap at the end of the whole process should have a similar density as a mixture for pancakes. During melting prepare moulds. We leave it to you to be imaginative, plastic box for margarine can be used for example. Brush some oil on the soap mould so a homemade soap could slip out of the box easily. When you get a mixture of the aforementioned density add the almond oil and stir it all together. At the end add oatmeal and essential oils (if applicable), mix well, turn off the heat and pour the mixture gently into moulds. Thus obtained homemade soap from goat milk needs to be put in the fridge to solidify, and then extradite him from the mould. Chop the soap to the appropriate pieces and leave them to dry in the air a couple of days. Turn them occasionally to evenly dry up on all sides. It would be ideal to dry it 15-20 days. Making a soap from goat’s milk is not at all naive as it seems, but go slowly and you will succeed. You will get a remarkable natural soap for your face that accelerates regeneration of the skin, it better moisturizes, slows skin aging and soothes inflammatory process. No creams can replace this homemade soap. Although the soap can easily be taken from the shelf at the store and simply brought home their preparation is something totally else. We would say that making homemade soap at home is a very creative and interesting hobby. Do not forget that a high quality local handmade soap can reach a high price. This is a great opportunity for each of us to turn this into a hobby and a lucrative business. If selling soap is not a goal in your life do not worry making soap offers much more than that. You will allow your household to join you in your new interesting hobby (this is especially good for children), not to mention what you will make a positive step for your health and for your household. Homemade soap you made with your own hands, will be much more effective for your skin than the one you buy at the store.